As global warming melts the Arctic ice, dreams of a short sea passage to Asia--and riches beneath the surface--have been revived. With Russia planting a flag on the ocean floor at the North Pole, Canada talking tough and Washington wanting to be a player, who will win the world's new Great Game? 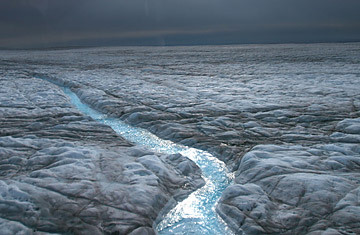 Melted water runs over a glacier in Greenland. At the end of August, a wisp of flame suddenly appeared in the Arctic twilight over the Barents Sea, bathing the low clouds over the Norwegian port of Hammerfest in a spectral orange glow. With a tremendous roar, the flame bloomed over the windswept ocean and craggy gray rocks, competing for an instant with the Arctic summer's never-setting sun. The first flare-off of natural gas from the Snohvit (Snow White in Norwegian) gas field, some 90 miles (145 km) offshore, was a beacon of promise: after 25 years of false starts, planning and construction, the first Arctic industrial oil-and-gas operation outside of Alaska was up and running. Norway's state-owned petroleum firm Statoil could finally exploit once unreachable reserves, expected to deliver an estimated $1.4 billion worth of liquefied natural gas each year for the next 25 years. But in a place where the aurora borealis normally provides celestial beauty, Snow White's luminous apparition also signals caution. What will a new era of exploitation bring to the Arctic, one of the earth's last great uncharted regions? The vast area has long fascinated explorers, but it has just as long been the site of folly and exaggerated expectations. Over centuries, hundreds died in the doomed search for an ice-free Northwest Passage between Asia and Europe, many of them victims of ill-fated stabs at national and personal glory. This summer, however, saw something new: for the first time in recorded history, the Northwest Passage was ice-free all the way from the Pacific to the Atlantic. The Arctic ice cap's loss through melting this year was 10 times the recent annual average, amounting to an area greater than that of Texas and New Mexico combined. The Arctic has never been immune from politics; during the cold war, U.S. and Soviet submarines navigated its frigid waters. But now that global warming has rendered the Arctic more accessible than ever--and yet at the same time more fragile--a new frenzy has broken out for control of the trade routes at the top of the world and the riches that nations hope and believe may lie beneath the ice. Just as 150 years ago, when Russia and Britain fought for control of central Asia, it is tempting to think that--not on the steppe or dusty mountains but in the icy wastes of the frozen north--a new Great Game is afoot. Russia is at the thick of the new game. In an expedition that lacked nothing in patriotic bluster, a Russian-led team descended to the seabed on Aug. 2 and planted a titanium Russian flag directly on the North Pole. In early September, Russian bombers launched cruise missiles during Arctic exercises. But it isn't only the Russians who are staking their claims. On Aug. 10, Canadian Prime Minister Stephen Harper flew to Resolute, a hamlet of 250 souls on Cornwallis Island in the northern territory of Nunavut, and announced plans for an Arctic military training facility and a refurbished deepwater port on the Northwest Passage. Then Danish scientists set sail on an expedition to map the seabed north of Greenland, a Danish dependency, and--not to be outdone--the U.S. Coast Guard dispatched the cutter Healy on a similar mission north of Alaska. The flurry of activity has prompted the Senate Foreign Relations Committee to schedule hearings this month to push for U.S. ratification of the international treaty on the Law of the Sea, which came into force in 1994. Ratification of the treaty has long been opposed by conservatives, who consider it a shackle on U.S. sovereignty, but it now has the support of the Bush Administration, largely because its terms would allow Washington to weigh in with its own claims in northern waters. The current interest in the Arctic, in short, is a perfect storm seeded with political opportunism, national pride, military muscle flexing, high energy prices and the arcane exigencies of international law. But the tale begins with global warming, which is transforming the Arctic. The ice cap, which floats atop much of the Arctic Ocean, is at least 25% smaller than it was 30 years ago. As the heat-reflecting ice that has made the Arctic the most inaccessible and uncharted part of the earth turns into water--which absorbs heat--the shrinkage is accelerating faster than climate models ever predicted. On Aug. 28, satellite images analyzed by the University of Colorado's National Snow and Ice Data Center revealed that the Arctic ice cap was already 10% smaller than at its previous record minimum, in September 2005--and it still had about a month of further melting to go. "If that's not a tipping point, I'd hate to see what a tipping point is," says Mark Serreze, the center's senior research scientist. Trausti Valsson, a professor of environmental planning at the University of Iceland in Reykjavík, says Arctic warming has become a "self-propelling" process that could leave the Arctic Ocean ice-free in summers by 2040. Even in winter, says Valsson, ice coverage would amount only to what could form in a single season, meaning that "Arctic shipping, with specially built ships, will be easy in all areas during the whole year." As shrinkage of the ice has made it easier to access the Arctic, competition for the region's resources has intensified. David Ooingoot Kalluk, 66, an Inuit who has hunted on the ice around Resolute for the past 48 years, has sensed the weird new world to come. "The snow and ice now melt from the bottom, not the top," Kalluk says as he glances out over the almost ice-free waters of Resolute Bay and fingers a pair of binoculars. He used to take dogsleds across the ice in June to hunt caribou on nearby Bathurst Island. Now, he says, the ice is too thin even in early May. If the warming continues, he fears that the cod population will shift farther north, disturbing the food chain for the ring-necked seal--the natural staple of the polar bears that regularly stalk the hamlet in the winter months.